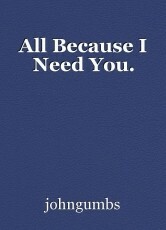 All Because I Need You. Whenever a man needs the one he loves, he opens up his heart to her. A short poem. Hear me, that's what I say. The depth of your words is outstanding. Well penned!